On March 21, 2015, I had the pleasure to share the gift of reading with the “Birdy Book Club.” What a wonderful group of young men. I am proud of their parents and grandparents for beginning to instill the love of reading at such a young age. My parents did the same with me. Birdy Book Club members show Brian via FaceTime one of their favorite pictures from his book. Overcoming the Fear of the Baseball details a childhood experience when I was hit in the face with a fastball. Instead of calling it quits, I was forced to face my fear and return to the baseball field where I went on to play 15 years of Major League Baseball. Time-Out For Bullies discusses how my mother taught me first-hand what bullying was and how it negatively impacts children. I then reveal how I used my athletic ability to help those dealing with bullies in my school. Some ask why I decided to write children’s books. It came from my wanting to find ways to educate youth, get them to read, and have others learn from my experiences. I thought if I could engage youth at a young age then maybe I could capture their minds to read and to learn to believe in themselves to reach their future goals. Mr. Wade Hudson from Just Us Books, Inc. in New Jersey published my first book. He heard my story and wanted to help me get started. He taught me the process of publishing a book and leveraged his best creative people to illustrate my book. I was blessed to have met Mr. Wade Hudson and what he is trying to do through Just Us Books, Inc. to get youth to read. I went on to write and self-publish other books and at the end of the day I just really want youth to read and believe in themselves to reach their dreams. The hardest part for me about being a children’s book author is my transition. Most of the world sees me as an athlete, and yes I did play Major League Baseball and in the NFL, but I also received my education while I was in college. With that education, I knew that after sports I could transition and do multiple items. So many athletes just see themselves as that, but I knew that at some point my body would not be able to compete at those professional levels and my education from University of Richmond would take me further. Getting others to take a retired professional athlete seriously as an author has been challenging. But as people see my love for writing and reading about children and my publishing new books, this makes people realize I am serious and they are respecting me as an author. Thank you to Kelly Starling Lyons for reaching out to me to do this children’s reading virtually. I welcome others to leverage my books to help youth develop the love of reading and to find that confidence in themselves to reach their goals. Wow, technology is taking us places quickly! This is really cool. I am a pre-kindergarten librarian who reads I Told You I Can Play! to my kids every year. One young boy started clapping after I finished the story, saying “I love this book!” This what all teachers want to hear! 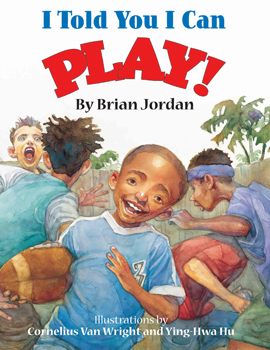 Brian, I have been reading “I Told You I Can Play!” to my pre-k library classes for the past 2 years. One boy, who often began classes by refusing to sit, clapped his hands with joy and said “I love this book!” after the read aloud was over. The fact that this book reached him and so many other boys (of all racial backgrounds) who may not see school as relevant or interesting (even at 4 years old) means that there is an obvious need for more of these books to be published. And my female students liked the book, too! 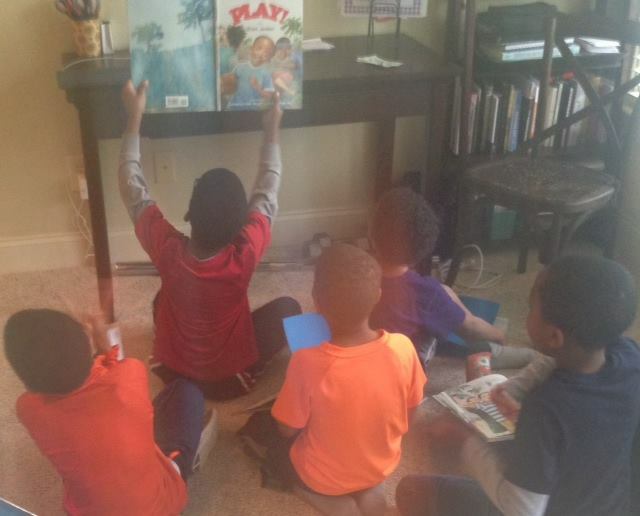 I also showed the picture of you and your children because it is important for all students to see that Black people can be authors (although it’s sad that this still needs to be pointed out in 2015). The kids mostly focused on the children and their names. I ordered your book from Just Us Books because I specifically wanted what we are now calling “diverse books.” I am biracial and in my 50s. When I was growing up, there were very few books out there that spoke to me as a biracial/Black child. Piri Thomas and Claude Brown books were examples but those are for much older children. Thankfully I can look to Just Us Books and now the Brown Bookshelf as well for ideas. Because of changes in our school district, I now have the opportunity to teach K-5 library classes. I look forward to introducing your books to older students. 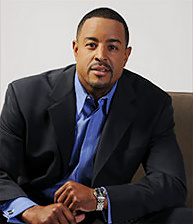 Thank you Brian Jordan for writing and Brown Bookshelf for publishing Brian’s column here!